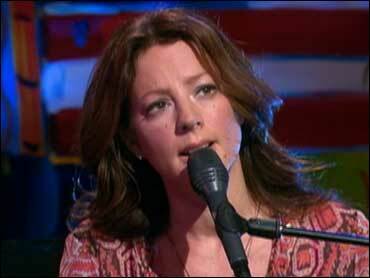 Singer/songwriter Sarah McLachlan, best known for hits like "I Will Remember You" and "Building A Mystery," has sold more than 40 million albums worldwide since beginning her career in 1988. In celebration of her 20th anniversary, the three-time Grammy winner just released a collection of her greatest hits titled "Closer: The Best of Sarah McLachlan." The album contains 14 classic tracks personally selected by the artist as well as two newly-recorded and previously-unreleased songs, "U Want Me 2" and "Don't Give Up On Us." Mclachlan stopped by The Early Show studio to chat with Harry Smith about the new album and her successful career. Sitting at a piano following her performance of the soul-baring song, "U Want Me 2," Smith asked "what was it like to write it?" "I have a piano upstairs in my house. I have a piano in my studio, which is at my house, as well, which is nice. So I just noodle late at night," she said. "This one, I wrote with my producer." Which comes first -- the notes or the words? "Most often, the music comes first and the melody, and maybe a few words," she says. "Then I have to try to figure out what it is I'm trying to say emotionally and say it in a succinct and interesting manner, fitting it into a certain phrase, which is the challenging part." The song, she says, is somewhat autobiographical. McLachlan, who was married for years, and her producer were each separated from their partners, "So we had a lot to talk about the past couple of months," she said. The album is a compilation of McLachlan's best-known work, and she says the choices were obvious. "When I thought of a 'Best Of"...this is something for my fans and when I play live, which songs get the biggest reaction."